The kitchen is the heart of the home, especially at Thanksgiving. Kids love to be involved in holiday preparations. 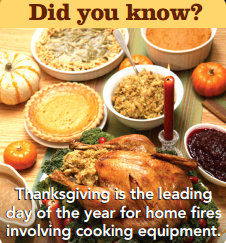 Safety in the kitchen is important, especially on Thanksgiving Day when there is a lot of activity and people at home. Follow these important safety tips to help keep your family safe! The above is an excerpt from the article, “Thanksgiving Safety in the Kitchen.” For more information, please visit www.nfpa.org.